Following my beginners article on Community Goals, I thought I'd follow up with a non-combat path to credits within the Elite galaxy. What is "The Road to Riches"? The road to riches is a method of obtaining large amounts of wealth and exploration rank, by following a preset list of star systems and planets, in order to scan them with the detailed surface scanner. The planets listed are mostly water-worlds and earth-like worlds; basically the highest value items to scan. The completed list is worth more than 300M credits. 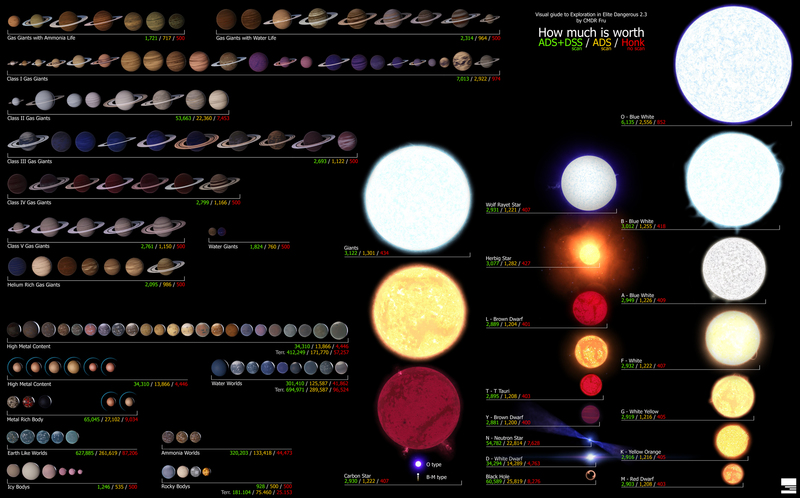 This info graphic shows what each planetary body is worth on the “honk” of the advanced discovery scanner, for a basic scan (where you fly close enough to the body to scan it) and a detailed surface scan. The detailed scans are worth the most credits. Exploration rank is based on the credit value of items scanned, so more money equals more rank. This info graphic has been widely published since May 2017 - Author unknown. The exploration data is not dependent on you being the first to discover it (although that would pay out a lot more credits) so any CMDR can do this once, no matter who else boldly went before them. Is there only one road? No. The concept of exploration riches has been around a long time. It seems to have originated as a “fast money” exploration technique scanning neutron stars, one such article was posted by CMDR TG_Equilibrator on Reddit as early as August of 2015. At this point it was one of several suggested exploration money making methods, but the first published “Road” was on 4th June 2017 by CMDR VicTic/SchmicTic, who published an exploration route of 301 high-value planets in 241 systems that could be done in 2.5 hours and net around 280M credits! There are now tools and companion apps for the road and it has become a longer and more valuable route; some of these tools will even allow you to create your own custom road! What ship do I need? As long as your ship has an Advanced Discovery Scanner, a Fuel Scoop and an FSD range over 15ly, even a Sidewinder can do it. Ideally you would also want a a Detailed Surface Scanner as this will double your scan payouts. The Advanced Discover Scanner costs 1.5M CR, so there is a cost bar to entry in this process. A Sidewinder would cost (in total) around 1.7M CR, even without the Detailed Surface Scanner (1.98M with) so you will need some cash reserves to get started. It might because everybody plays at their own pace in their own style. Flight times in super-cruise vary, as some bodies are further away from the primary star, which means the time taken in some systems can be much longer. You could do the whole road in a matter of hours, or if you only have a few hours free in an evening like me and are not in a hurry, you might be at this for weeks. This is a get rich scheme, but not necessarily a get rich quick scheme. Will the new exploration tools “break” the road? No. While the “honk” will stay the same, the new exploration tools replace the detailed surface scanner. This will mean you can scan the planetary bodies from the arrival point at the primary star, meaning the process will involve less flight time in super-cruise, so faster money and less wear-and-tear on your ship. However, the new mechanic also adds surface probes which may actually add to the earning capacity of the road. We’ll see how much after the Q4 update drops. What were those tools again? With these tools a second monitor (or maybe a tablet if you're on a console) is really useful.